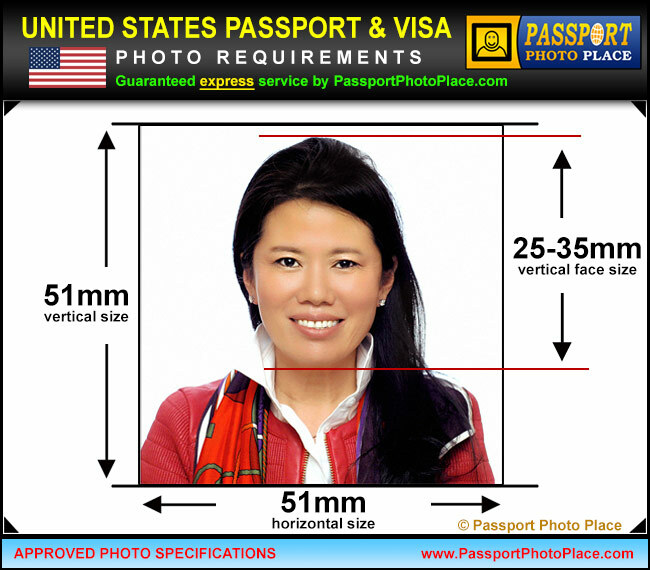 At Passport Photo Place, we take and process US passport pictures and visa photos within 15 minutes. 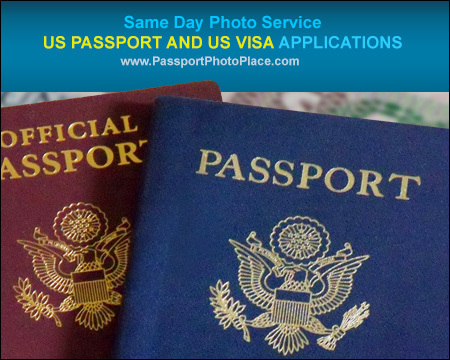 We can provide both printed versions and electronic jpeg files for passport and visa online applications. U.S Department of State recommends to use professional photo studio service to avoid rejects and delays associated with rejection of applications. Guaranteed acceptance! No application delays. We always update our photo studio equipment to produce professional quality photographs that look good and accepted by Embassies and Consulates. Please wear a solid-colored top/shirt that is not white. White is not accepted since the background color for US visa and US passport photographs must be white. Photo must be taken against a uniformly lit white or slightly off-white background. Printed in full color on a matte or slightly glossy high quality photographic paper using a digital dye sublimation printer. Inkjet printing is not accepted. If wearing glasses are part of your daily routine, only prescription and non-tinted glasses are allowed to be worn. A medical certificate confirming the glasses prescription might be required at the time of application. Electronic Visa picture files are an essential part US visa application. If the image is not properly formatted per visa specifications, the US government visa application system will not allow to submit an online application. The image must have a square aspect ratio with minimum acceptable size of 600×600 pixels and maximum size of 1200×1200 pixels. The photo must be in full color and digitized in 8-bits per color channel resulting in 24 bits per pixel color. It must be encoded in sRGB color space. Acceptable photo document digital file format is JPEG with compression adjusted to produce a file size between 100kb and 240kb. Images compressed to produce file sizes below 100kb do not retain sufficient quality and may not pass application verification process. If you have a printed photo and you would like to digitize the photo, it must be scanned by a professional scanner using resolution of at least 300dpi and the resulting photo must be at least 600×600 pixels in size. Digital files must be submitted online in the original form as provided by a professional photo studio. Images cannot be adjusted, cropped or altered in any way. All passport and visa photographs must be taken within the last 6 months. If any variations in appearance of the applicant is present at the time when an application is submitted, the photos must be re-taken or the passport and/or visa applications will be rejected.